Government Bank Job Circular published for the post of Senior Office 2017 . All bank under Govt. 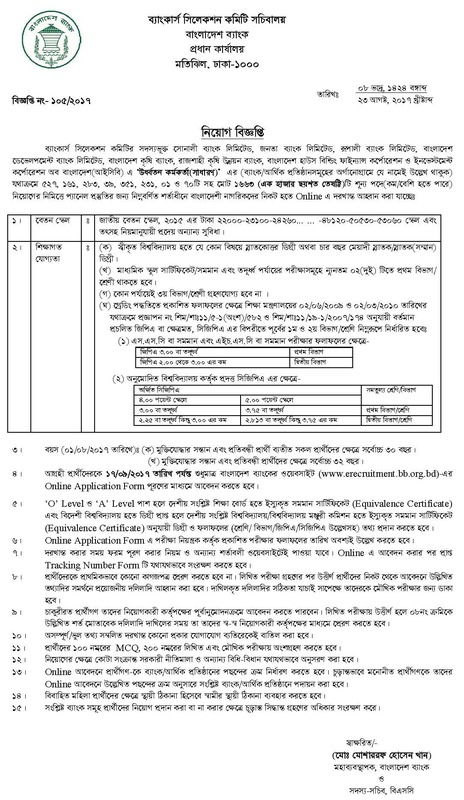 of Bangladesh published a huge recruitment notice. They are Sonali Bank Limited, Janata Bank Limited, Rupali Bank Limited, Bangladesh Development Bank Limited, Bangladesh Krishi Bank, Rajshahi Krishi Unnayan Bank, Bangladesh House Building Finance Corporation and Investment Corporation of Bangladesh. This a huge recruitment under Banker Selection Committee of Bangladesh. Educational Qualification: 4 year Honors/Masters degree from any Govt. approved university. At-least two first division/class. Third division/class in any stage of examination is not allowed.